Since I’ve owned it, I have also modified the airbox, installed UNI Pod filters and installed a Dynojet Power Commander (PC) module. With this setup, it was recommended to download and install the British Customs “tune” file and use it to tune the PC for this Thruxton. After installing the PC and this tune the Thruxton ran okay, but I noticed that my fuel efficiency was sub-standard at only 30 MPG. I researched other tune options on TriumphRAT.net as well as with Johnny Scheff’s (Motoworks) friend Max Materne of The Transportation Revolution in New Orleans who have used the Power Commander on Johnny’s race Thruxton. I considered adding the Dynojet Auto Tune module, but Max recommended a custom dyno tune to really dial things in. 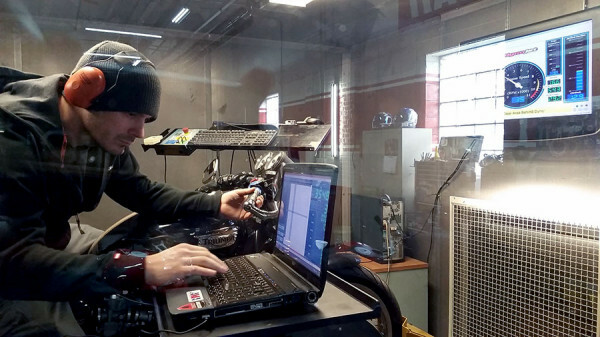 So, I contacted a local Triumph dealer called Motor Cycle Center in December 2014 and asked about their Dyno Tune process. 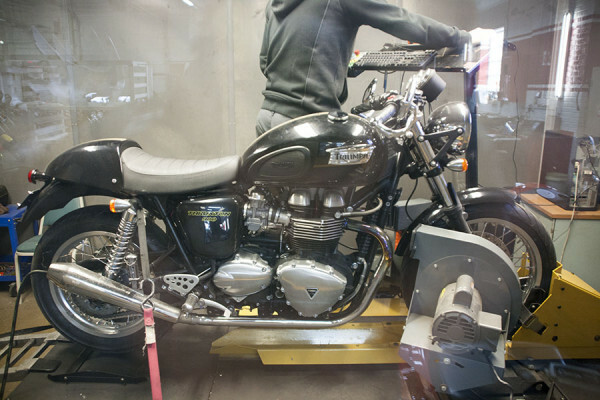 Nick in the Service Department let me know they had a Dyno Tuning winter special going on, so I took my Thruxton in on January 24, 2015. The Chicago weather was pretty mild in the mid to upper 30’s, and roads were dry. 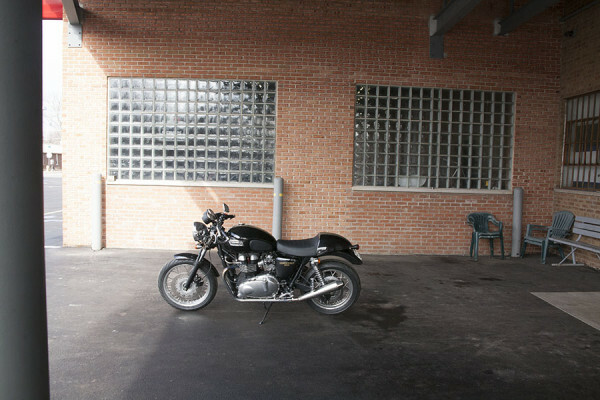 I had been riding the Thruxton to work all the previous week. I arrived about 9:45 AM and checked the bike in with Nick in Service. The Dyno Tune process was completely done and I left MCC a little after 12 noon. MCC has a nice location and facility that they moved into a few years ago. The building used to be an auto dealership so there is a large showroom, service area, and a large parking lot! MCC is the oldest Chicago area Triumph dealer where I bought my 2008 Bonneville in June of 2008. 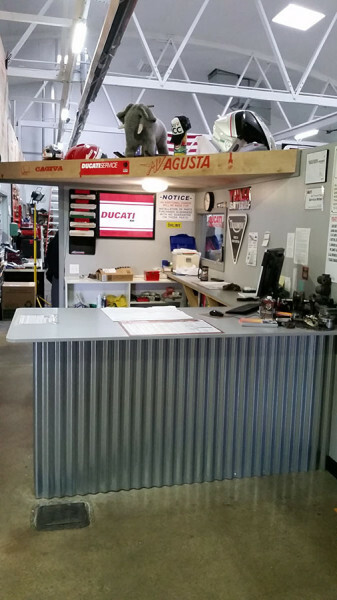 MCC is also a: Ducati, Norton, MV Agusta, KTM and Husqvarna dealership. 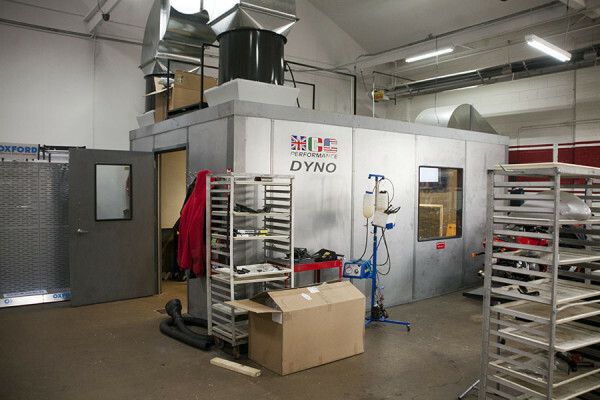 The Dyno is located in a soundproof room within their service area. MCC kindly allowed me to take photos of the process for this blog post. 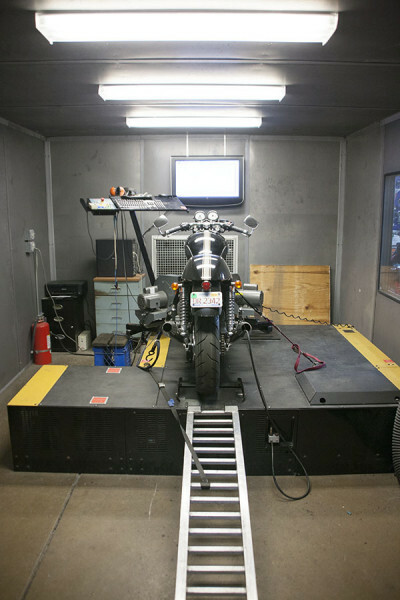 A couple service technicians loaded the Thruxton into the Dyno room and got it all setup. Thruxton mounted on the Dyno, ready to test. From a side window, I was able to watch the process. This is an extremely loud process! 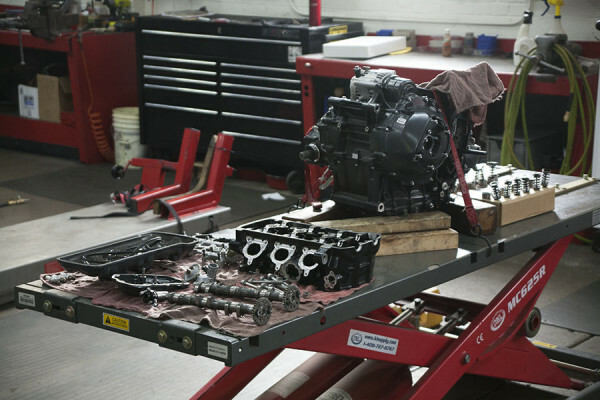 Random shot: An engine disassembled in the MCC shop. Aaron and another tech checking the computer readouts from the Dyno run. Aaron fine tuning on the final third Dyno run. After the first run, Aaron told me that he discovered that the BC tune was pretty close at 50% throttle and above. However at throttle levels below 50%, especially right in my cruising range, the engine was running too rich. This explained my poor fuel economy. On Dyno runs 2 and 3, Aaron tweaked the tune map to optimize for an Air/Fuel mixture in the 12-13 range (performance), rather than where it had been around 10 (too rich). Aaron tweaking the tune for each Dyno run. The published HP for a 2012 Thruxton is 68 HP and 51 lbs. of torque. But, everyone knows these numbers are not accurate and are usually high, or not measured at the rear wheel. The HP on my Thruxton increased from 64.62 to 66.54 at the rear wheel. 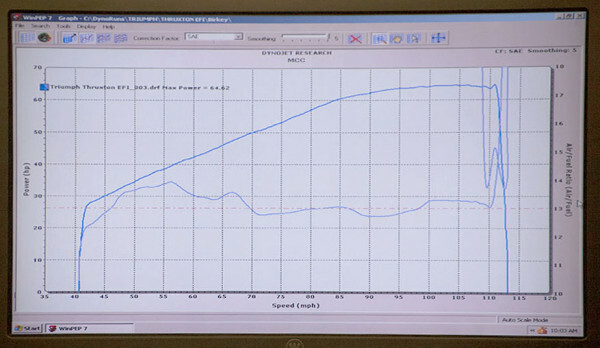 The torque also increased from 51.68 to 52.83 ft. lbs. Plus, my fuel efficiency should be improved. I am very pleased that the modifications I’ve made have brought the real world HP and torque to Triumph published specifications. I had a great experience having my Thruxton Dyno Tuned at MCC. Everyone in the service department starting with Nick over email were very helpful and professional. Judging from the printouts and my ride home, Aaron knows what he is doing! I’ll post an update here after I’m able to measure my fuel economy. 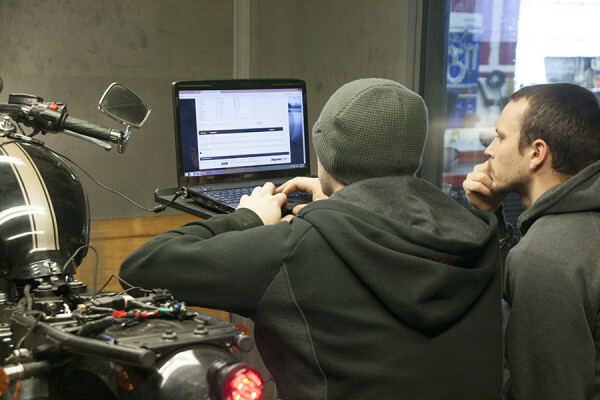 MCC Dyno Technicians: Nick, Aaron and another tech. 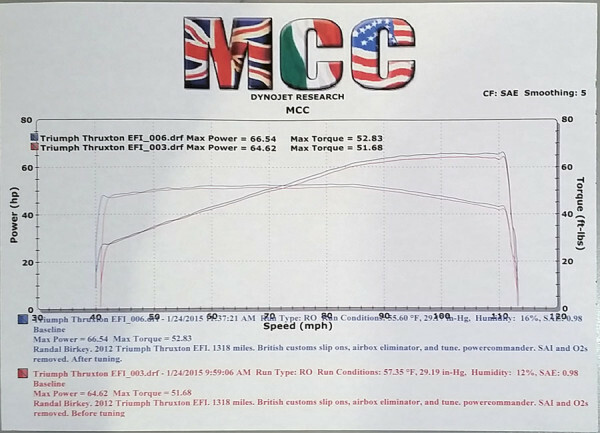 I would recommend any Triumph owner (or any motorcyle really) to consider using MCC either for a baseline Dyno run to know where your bike is, or for a performance tune after making modifications like I did. All Dyno tuned and ready to ride. The weather in Chicago was milder today, near 40, dry and clear. So, I took the Thruxton for a spin that included some highway speeds in excess of 80 MPH (Ton-up!). On one stretch I burned .89 gallons and went 31.3 miles = 35.16 MPG. So, there is about a 5 MPG increase since the dyno tune, and probably better if I kept it under 70 MPH. Still, my ’08 Bonnie with 42mm Mikuni Carbs gets 40 MPG city and 50 MPG Highway! I am guessing it is because the 08 engine breaths even better and burns the gas more efficiently than the ’12 Thruxton. Just a temp comment – (meaning ok to delete this) The bike was rich at smaller throttle openings, causing poor mileage i.e. “10:1” is richer than desired, not leaner. Thanks for the catch… you are so right! – Corrected above! I was just curious about your opinion in regards to the performance of the Thruxton with the performance upgrades (since is fuel injected), compared to your bonnie with the modification done to it? 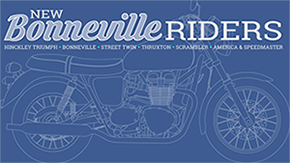 So far, the upgrades I’ve made to the Thruxton do not compare with the performance I’ve experienced with the Bonneville upgrades. With throttle bodies that are only 26mm on the intake side, you can’t expect the same results as 42mm carbs. But, within those parameters, it’s pretty good. Of course, this difference will change even more when I get the rebuilt 865cc engine back bumped up to 1100cc, with cams, head and balanced crank! 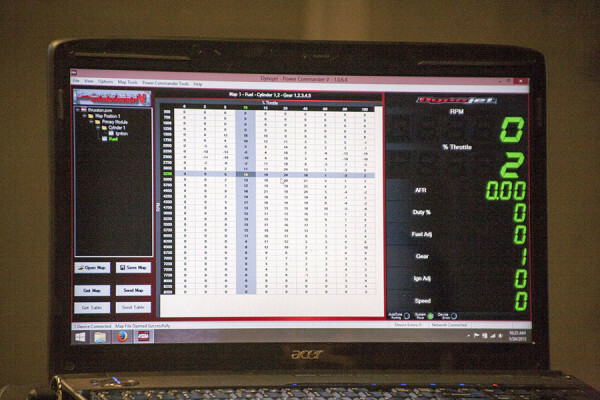 Did you do the $95 dyno run or the full $395 Rexxer dyno run. I made a few modifications this year to my Thruxton, and I’m having idling issues and I too think it’s running rich as well. I just want it tuned properly vs sitting at idle. I also don’t want to spend $400 on a dyno tune when I just need the $95 one. Thanks!